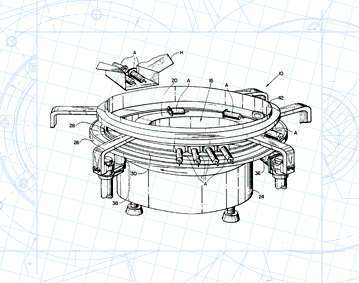 An apparatus for orienting and feeding axially elongated articles has a feeder bowl which includes a helical ramp surface which terminates at the upper edge of the bowl. An annular ring supported for rotation around an upper portion of the feeder bowl has an upwardly facing article supporting surface contiguous with a terminal portion of the ramp surface to receive articles there from. An annular baffle disposed above the ring and in coaxial alignment with it coacts with the ring to successively release articles from the ring to a guide conveyor which directs the articles tangentially away from the ring. Separate independent drive mechanisms are provided for vibrating the feeder bowl and rotating the ring to enable the feeder bowl to operate intermittently to discharge articles onto the ring which may operate continuously.